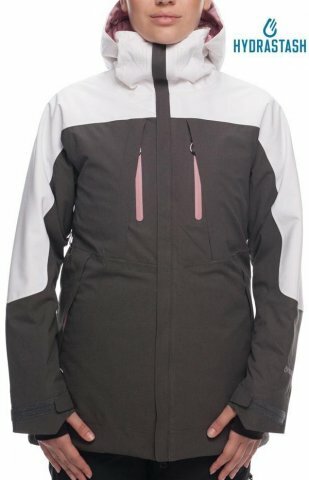 The 686 Hydrastash Women’s Jacket brought us something surprising and new, there’s an integrated water reservoir in the powder skirt with a zip in water tube that comes right up to the collar of the jacket. It’s a great idea, and I know a lot of people who ride with the water backpack that this would a way to free yourself of the backpack. The Hydrastash jacket is also fully insulated as well as pretty highly waterproof. The hood was a little tight over the helmet, it is a pretty simplistic jacket besides the water reservoir, but is a fun and interesting option for sure. We try to get as many images of the 686 Hydrastash Women's Jacket, but forgive us if they're not all there.